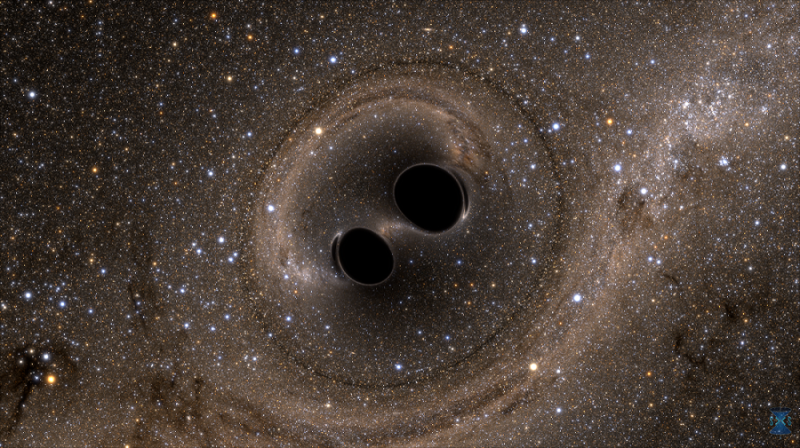 The discovery of gravitational waves by the LIGO experiment in 2015 sent ripples through the scientific community. Originally predicted by Einstein’s Theory of General Relativity, the confirmation of these waves (and two subsequent detections) solved a long-standing cosmological mystery. In addition to bending the fabric of space-time, it is now known that gravity can also create perturbations that can be detected billions of light-years away. Seeking to capitalize on these discoveries and conduct new and exciting research into gravitational waves, the European Space Agency (ESA) recently green-lighted the Laser Interferometer Space Antenna (LISA) mission. Consisting of three satellites that will measure gravitational waves directly through laser interferometry, this mission will be the first space-based gravitational wave detector. This decision was announced yesterday (Tuesday, June 20th) during a meeting of ESA’s Science Program Committee (SPC). It’s implementation is part of the ESA’s Cosmic Vision plan – the current cycle of the agency’s long-term planning for space science missions – which began in 2015 and will be running until 2025. It is also in keeping with the ESA’s desire to study the “invisible universe“, a policy that was adopted in 2013. To accomplish this, the three satellites that make up the LISA constellation will be deployed into orbit around Earth. Once there, they will assume a triangular formation – spaced 2.5 million km (1.55 million mi) apart – and follow Earth’s orbit around the Sun. Here, isolated from all external influences but Earth’s gravity, they will then connect to each other by laser and begin looking for minute perturbations in the fabric of space-time. Much like how the LIGO experiment and other gravitational wave detectors work, the LISA mission will rely on laser interferometry. This process consists of a beam of electromagnetic energy (in this case, a laser) being split in two and then recombined to look for patterns of interference. In LISA’s case, two satellites play the role of reflectors while the remaining one is the both source of the lasers and the observer of the laser beam. When a gravitational wave passes through the triangle established by the three satellites, the lengths of the two laser beams will vary due to the space-time distortions caused by the wave. By comparing the laser beam frequency in the return beam to the frequency of the sent beam, LISA will be able to measure the level of distortion. These measurements will have to be extremely precise, since the distortions they are looking for affect the fabric of space-time on the most minuscule of levels – a few millionths of a millionth of a meter over a distance of a million kilometers. Luckily, the technology to detect these waves has already been tested by the LISA Pathfinder mission, which deployed in 2015 and will conclude its mission at the end of the month. In the coming weeks and months, the ESA will be looking over the design of the LISA mission and completing a cost assessment. If all goes as planned, the mission will be proposed for “adoption” before construction begins and it is expected to be launched by 2034. In the same meeting, the ESA also adopted another important mission that will be searching for exoplanets in the coming years. This mission is known as the PLAnetary Transits and Oscillations of stars, or PLATO, mission. Like Kepler, this mission will monitor stars within a large sections of the sky to look for small dips in their brightness, which are caused by planets passing between the star and the observer (i.e. the transit method). Originally selected in February of 2014, this mission is now moving from the blueprint phase into construction and will launch in 2026. It’s an exciting time for the European Space Agency. In recent years, it has committed itself to multiple endeavors in the hope of maintaining Europe’s commitment to and continued presence in space. These include studying the “invisible universe”, mounting missions to the Moon and Mars, maintaining a commitment to the International Space Station, and even building a successor to the ISS on the Moon! The European Space Agency successfully launched the LISA Pathfinder, a spacecraft designed to demonstrate technology for observing gravitational waves in space. The launch took place at Europe’s spaceport in Kourou, French Guiana on a Vega rocket, at 4:04 GMT on December 3, (10:04 pm EST Dec 2), 2015. Gravitational waves are ripples in the fabric of spacetime, which were predicted by Albert Einstein in his General Theory of Relativity. So far, because they are extremely tiny and incredibly faint, gravitational waves have proved to be elusive. The technology needed to detect them is highly sensitive and therefore has been difficult to conceive, plan and build.